Description: Wheedle 1.To persuade or attempt to persuade by flattery or guile. 2. The game of stock taking and deal making. 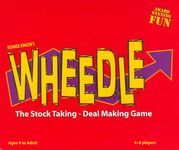 "WHEEDLE® is the freewheeling stock trading game where 4-6 players jockey for corporate control. In a flurry of no-holds-barred trading, only the craftiest players will survive. . . Break out WHEEDLE and rise to the top!" This game is Reiner Knizia's take on Pit. It consists of simultaneous trading of various stocks, trying to get a majority. Gameplay A card is placed facedown in the center, and the remainder of the deck is dealt out. When the central card is flipped over, players begin calling out what they're collecting or wanting to trade away: "Anyone have N Securities?" (or, more, likely, "I've got yellow, who wants yellow?") You can trade with anyone, any number of cards, including unequal trades. You may also swap one of your cards with the central card. When a player obtains a majority of all the stock types they have in their hand (for example, 4 of the 7 green cards and 3 of the 5 blue cards), play stops and the round is scored. Scoring: The player who stops the play gets +5 (or -5 if they don't have a majority after all). You get +2 for each stock card if you have a monopoly of that stock, and +1 per card if you have a majority but not all of them. Warning: You get -1 for each card in your hand that matches whichever stock is the central (bankrupt) card when the round ends. You get 0 points for any card that is not part of either a majority or the bankrupt company. After each player has dealt once, the game is over and whoever has the most points wins.